I got an email asking if my family and I might like to try a new treat from Crystal Farms Cheese. The gang was all here. I of COURSE needed to try the Chipotle and Habanero first. Love the spicy! And then we just opened the ones that were left for everyone else on vacation. What a neat, tasty and fun treat to put in your lunch, take on a long car ride, or just watching your favorite movie. 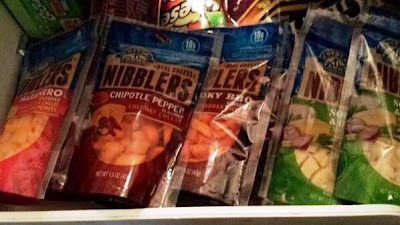 I had never heard Nibblers before Crystal Farms reached out to me, but since I have seen this treat at grocery stores from Pequot Lakes to Crystal, MN and many convenience stores in between. It is an affordable 99 cents (the price I saw them for where I looked) and a way better treat for your family than that candy bar or donut you would normally buy. Why not try them out the next time you are on the road or packing that school lunch? While these Nibblers treats were provided to my family free of charge - the opinion on Nibblers is mine alone. Never heard of them, but they look like they're the perfect size for snacking!